Join us for our next VBF Facebook Live Event! 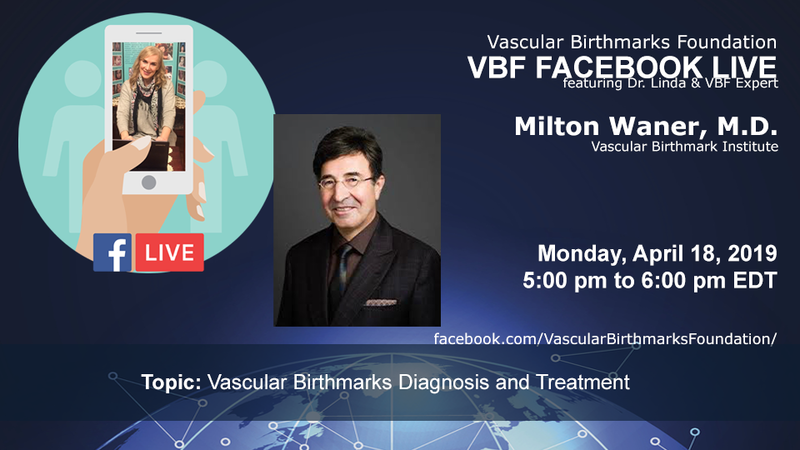 Get your questions answered in real time on Facebook by world-renowned Expert MILTON WANER, MD, BCH, FCS (SA) of the Vascular Birthmarks Institute at the Lenox Hill Hospital. Dr. Waner is a pediatric facial plastic surgeon with global recognition as an expert in hemangiomas and vascular malformations. He is Co-Director of the Vascular Birthmarks Institute of New York and Surgical Director of the AVM Center of New York at Lenox Hill. Then, tune in at 5pm New York time on Monday, April 18 to ASK THE VBF EXPERT.